As much as we try to avoid them, accidents happen. No one anticipates having to manage the financial and emotional hardships that occur in the wake of an accidental death or life changing injury. However, with PIU’s High Limit Accident Insurance, you can be prepared for the worst and eliminate the financial stress that accompanies a death or permanent disability due to a devastating accident. Petersen International Underwriters’ High Limit Accident Plan will cover an individual or a group 24/7 with issue limits from $100,000 to $100 million in the case of an accidental death or dismemberment. This high limit plan can also be tailored to insure you against specific risks such as war and terrorism (even in war zones), aviation, common carrier transportation, motor racing, and mountain climbing, to name a few. ABC Company who had two top executives traveling by private air charter to Baghdad, Iraq. They would be there for 48 hours before returning to the U.S. The concerns they had were that their group benefits (both life and disability) had war and terrorism exclusions. Petersen International Underwriters helped out by securing coverage for this war and terrorism risk. Just because it is a short term need, or an event that seems too risky, never say never and give us a call. At Petersen International Underwriters we know you don’t always have the time to complete the traditional insurance application process. Our High Limit Accident Insurance Plan will have you fully covered easily and quickly, with no medical underwriting and just a one page application. 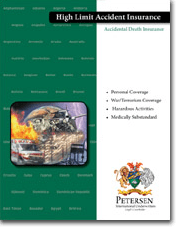 Accidents resulting in a death or dismemberment may not be avoidable, but when it comes to the excessive amount an accident can cost, Petersen International Underwriters has you covered with the High Limit Accident Insurance Plan.